Your Reaction: What did you think of Puccini's Tosca 2018? Here's what the audience had to say about The Royal Opera's production of Puccini's thriller. Bravi for #rohtosca at @RoyalOperaHouse tonight! @MalteseTenor is a memorable Cavaradossi, capturing the revolutionary fervour and the artistic passion of the character. 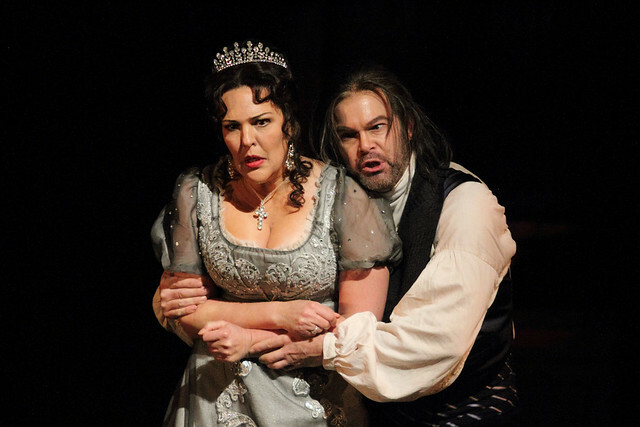 Adrianne Peiczonka is a powerful Tosca and @GeraldFinley is an exquisitely sinister Scarpia. Good actors, but I did not tremble as usual. Both emotive impact and expressive strenght were missing during tonight floppy performance. “E lucean le stelle” is traditionally so moving, powerful romantic..
#ROHTosca I enjoyed the performance but it didn't thrill me. The first act was only ok but it did get better. But I want to feel goose pimples and that was missing. What did you think of Tosca? Add your review in the comments below. 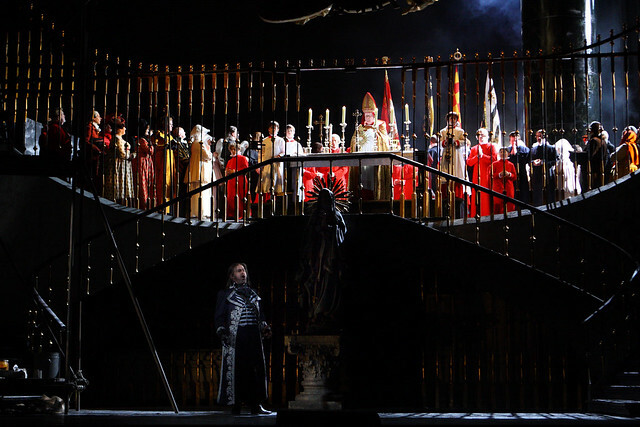 Tosca runs until 3 March. Tickets are still available. The production will be relayed to cinemas around the world on 7 February. Watch Tosca at a cinema near you. The performance is staged with generous philanthropic support from Mrs Aline Foriel-Destezet, Aud Jebsen, Rena and Sandro Lavery, The Mikheev Charitable Trust and Mr and Mrs Christopher W.T. Johnston. The white dress was created as part of the original production by Paul Brown, in which Angela Gheorghiu starred. When the production was revived, Mr Brown took the opportunity to design a second dress, which is a slightly different colour. Singers are free to choose which dress they would like to wear for performances. Many thanks for your comment, hope this clears things up. Thank you Miss Spencer for clearing this up. However the dress is not a slightly different colour it is grey, not white. Off white or cream would be slightly different! I would love to know why Mr Brown felt the need for another colour and why he thought the grey dress would suit this production. I don't think it does. About six years ago a reviewer described the grey dress as a looking like a dish rag! Without wishing to wage a ‘dress war’ your original comments are typical of the urban myths surrounding Angela Gheorghiu. It seems you automatically assume it’s a question of diva behaviour which I find intensely irritating. ‘Put it’s foot down...’, honestly! There's no avoiding those hospital ward noises (especially at the beginning of the third act) or a phone alarm going off three times, when the average age of the audience is 65+. This is surely not on the ROH. But the tempo of "Te Deum" and "E lucevan le stelle" (especially the latter) felt way rushed. I couldn't tell if it was Calleja rushing and Ettinger chasing him or the other way around, but it surely weakened the emotional impact of the aria. I did appreciate Calleja's beautiful diminuendo though. I saw Tosca today and completely agree with the comments of Jules and Attila.I love this opera so much but think that Tosca is definitely not the role for Pieczonka. She definitely lacks lustre and sometimes her height was quite shrill. The orchestre was also far too loud and the singers had sometimes trouble getting through, especially in the first act. I am very fond of Calleja and think he has a beautiful voice. I loved him as Polione in Norma but Cavaradossi is not really his role. The whole performance did not grap me, as I am used to, but left me quite cold. On January 24, Angela Gheorghiu brought the house down. She was outstanding, divine..A huge difference from last week! Everybody worked much better because of the passion she brought...The chemistry between Gheorghiu and Calleja was fantastic. I thought and hoped it will be better than last week, but did not expect Gheorghiu to command the entire performance and single-handedly manage to change the dull atmosphere conveyed in the previous performances when Pieczonka was portraying Tosca...Thank you ROH! Thank you Gheorghiu! I'm ecstatic I got tickets for tomorrow as well! I don't mind which dress AG was wearing - she lifted tonight's (Sat) performance to a whole new level - absolutely grabbed the show and took all the other principals with her. Beautifully sung as well. I fully agree...it was superb. She seems in a great place now and ‘Vissi d’arte’ really moved me. Uneven casting and sometimes unconventional interpretations, but rarely failing to engage. Calleja is more lyrical than heroic, with some wonderful diminuendi. He surprised me by playing the 'knowing' victim at the end and did it convincingly. Finley isn't the usual sadist, more a weak sensualist newly empowered to do what he's always wanted to. Took a while to get used to but made for an interesting second act. Pieczonka never inhabits her character but goes through the motions well enough. I never had a real sense of her being driven to desperation. Amazing how her dress is spotless in Act 3! Alex Hall stood out among the smaller roles as a seedy Spoletta. The production works well but has one or two oddities. Why does Scarpia have the hair of his Napoleonic replacement while the progressive Angelotti is stuck in the previous century? And were the guards at the Castel Sant'Angelo smoking cigarettes? Over all, this was the mirror opposite of last night's Salome, which for me is a plus. Plenty of flaws but still an effective piece of theatre. That's why Strauss is the Puccini of music but Puccini is the Puccini of opera. Very disappointed with Pieczonka’s performance on 31 January. No passion and the acting was embarrassingly wooden. I thought Calleja sang really well and was very convincing as an idealistic young man. Bizarre scene of a guard painstakingly washing himself in the last act. Still can’t figure out how it adds to the drama. Saw 24th evening. Could not believe the reviews prior to it based on 24th. Possibly the best Tosca performance I have ever seen, and I have seen a lot. It totally moved me. Orchestra were not too loud. Nor too fast. Nor too slow. La G sang wonderfully ; conserved herself for the best bits vocally for sure, but acted phenomenally well throughout. Ran out of puff slightly in last Act. Calleja beautiful vocally, and convincing. Finlay ? - I have no idea why critics (and audiences) assume that Scarpia has to be a snarling decibel beater. Sinister and threatening need not be loud, and can be silk-like. Absorbing and thrilling from first to last. I went with my brother to see Tosca on Sat 3rd Feb, and I thought the whole cast was excellent - the 3 principals top notch and Pieczonka excelled in the Vissi D'arte aria. The only slight niggle I have was the guard dressing scene at the beginning of Act 3 which in my mind was incongrous with the scene and opera. Apart from that I and my brother Paul Samuel enjoyed ourselves immensely. The Feb 3 performance with Pieczonka as Tosca was so disappointing I considered leaving at the first interval. She hits the notes, but her voice is utterly unmusical and she has no acting ability. 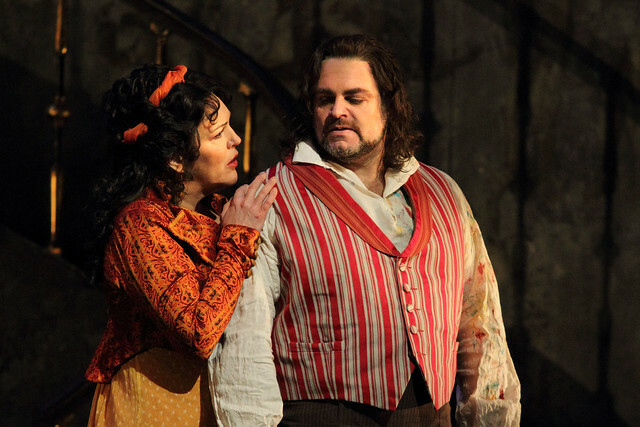 The charming, flirtatious encounter between Tosca and Cavardossi in Act 1 came across as a tiresome quarrel. Kudos to White as the Sacristan, who leavened this otherwise ponderous Act 1. I feel sorry for Calleja as he was splendid as Cavaradossi, in spite of Pieczonka and Ettinger's lugubrious conducting. He has a rich vibrant voice and clearly can act if only he had a competent partner. Ettinger appears to know nothing either of timing or dynamics. Finley was acceptable as Scarpia, though without the appropriate level of cruelty and menace. All in all, an entirely forgettable Tosca. Went to see Tosca tonight at live cinema broadcast it was amazing most sinister Scarpia I have seen ever . . These broadcasts are the best idea anyone ever had. I too thoroughly enjoyed this Tosca. Finley was just superb as Scarpia, outstanding in my opinion. - what a superb interpretation of the role ,and Calleja was great - lovely voice.. Not over-impressed with Pieczonak as Tosca - she did not do it for me - but overall it was a really good performance and I really enjoyed it - Tosca being my favourite opera.. Found the soldier dressing did not add anything to this performance - but how wonderful to be able to see the performance "live"
Jan 27 La Gheorghiu is not only a fabulous singer but she combines it with superb acting; in short: a singing actress. That was the power of La prima donna assoluta Callas and is also true of La Gheorghiu. The staging was a bit dark but after I saw Boheme in Paris in December which was based at ....the moon anything goes. I've never ever booed as hard as then and felt sorry for Dudamel who tried to continue but was stopped by the audience multiple times. When it was quiet again somebody shouted "scandaleux" or "vergognati" and the whole circus started again. La Commedia e finita! I thoroughly enjoyed this wonderful opera I could have watched it again. Powerful performance from all the cast. But the whole thing was very dark. The background was so black that it was difficult to find cast and scenery, unless some colour in costumes. Not a good production for me. Joseph Calleja excellent, as usual. Ettinger kept this performance alive. Adrianne Pieczonka was utterly hopeless as Tosca. Miscast is generous. The changes made to the staging in this latest outing of the production took away so much of its original impact. Dumbing down this production does not make any sense at all. Poorly restaged and re-directed without depth or electricity and with a miscast Tosca to match it did not reflect well on ROH. This is the first time I've watched an Opera Live broadcast and I think it's a difficult leap from opera house to cinema. From afar, perhaps Pieczonka could pass as Tosca, but up close her acting was really lacklustre and wooden - she was just going through the motions and I have to agree with Mary Rawlinson's comments. However, loved Gerald Finley and his demonic expressions and restrained menace. I'd have gone for him myself! In a performance which is being transmitted in close up, singers have to remember that the audience is scrutinising their every move. Beautiful music with good voices, but no sexual chemistry between the main characters. Pieczonka’s Tosca was unable to convey the flirtatious captivating nature of Tosca. Scarpia had exaggerated bulging eyes and face pulling but no real menace. I agree with Mary Rawlinson's review apart from the comments about Ettinger. I watched Tosca at my local cinema, a real treat for the ears, but the eyes really couldn't cope with such unnecessary close ups. We don't get up close and personal in the theatre and opera really isn't a close up sport. The screens are vast so every filling and pimple is visible. Thanks for a great performance, but keep a distance please. Perhaps the best production of Tosca I've seen. Definitely the best ever Scarpia. At the end of Act 1 all I could say was "Wow" And yes, I did get goosebumps. I think peoples expectations are unrealistically high these days. My problem is with the voices, particularly in the higher range. The sound is often strident and almost screechy ( not microphones I hope ) please may we hear the natural voices of the singers. Wonderful Scarpia! I love opera, particularly when live at the ROH, and although I cannot agree with remarks in many of these comments, Celia Lewis' comments very much reflect my own. Today I battled through snow and ice to see the Opera Live broadcast and it was well worth the journey. Gerald Finley has created an exciting new menace in Scarpia, Joseph Calleja's acting skills came to the fore on top of his lovely lyrical voice and Adriana Pieczonka's vocals today did not let down her performance. Sadly, I did not get the usual buzz from Tosca's relationship with Cavaradossi - I just do not see Pieczonka as right for Tosca. Apart from this, I had no problem with the orchestra's volume and for nearly three wonderful hours I was totally immersed in the great score and lyrics, wonderful stage sets and, for me, a performance by all that was well above average. Thank you ROH. I really enjoyed seeing the live screening of Tosca last week. It is marvellous to be able to see top class opera in your local cinema - and the interviews and commentary are an added bonus. I thought Calleja wonderful - and Finley flesh creepingly brilliant. I agree that Pieczonka's voice was better than her acting skills, but they were good enough for the story to captivate me - and I was gripped till the final terrible second. Could I echo the request to reduce the emphasis on closeups, though? Thank you ROH.